War Child, an award-winning documentary directed by C. Karim Chrobog, chronicles the tumultuous, shocking, inspiring, and ultimately hopeful odyssey of Emmanuel Jal. A former child soldier of Sudan’s brutal civil war, he is now an emerging international hip hop star sharing a message of peace for his war-torn land and beloved Africa. 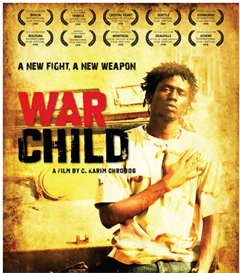 WAR CHILD tells the story of Jal’s life through his words and music and remarkable film footage dating back to his childhood. Today, as Emmanuel travels the world he takes us through his homeland’s tormented history of civil war, assesses the prospects for peace after the country’s 2005 ceasefire agreement, highlights the increasing problem of war children, and shines light on the growing African hip hop scene that is tackling the continent’s ills through its music.